Syfy’s original game show “Total Blackout” is returning for a second season on Tuesday, October 30th. 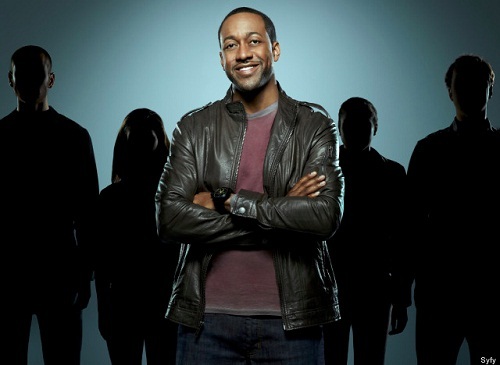 Returning host Jaleel White talked to us about the new season in an interview. Jaleel White said of his Syfy game show, “Total Blackout”, “If I have to be associated with TV that people will genuinely get a kick out of in droves…I haven’t had one single bad comment on the show.” While competing on “Dancing With the Stars”, White said he was in his trailer on his computer and said he watched as “Total Blackout” started trending on Twitter during it’s premiere night. “That’s what we do this for. We do this for water cooler. I saw the numbers start rolling in…80 tweets, 100 tweets, 240 something tweets” he said as the numbers started to build. When asked if there will be a celebrity episode of “Total Blackout”, White said, “we may have a surprise in store for you regarding celebrities on Total Blackout”. He says he’d love to have Harvey Levin from TMZ on the show. “He would be my dream person just from a karmic standpoint”. White said, “The contestants get smarter and the producers get smarter. Obviously theses contestants have seen the fist season of the show and sometimes they think they can outsmart us and it’s our job to stay one step ahead of them. For example last year when we had a couples show, we specified that both individuals in the couple had to participate in the challenge. We had a couple last year that got a little smart” White said that one person was more scared than the other. So one did the challenge while the scared one held their hand. “So we knocked that out this year and we’re keeping them honest,” he said. “There’s some really good maze stuff that we have with mouse traps this year. We have some really interesting food challenges” White said where contestants will have to guess the inside fillings of donuts. White didn’t mention what was inside of these donuts! “The show is growing. I didn’t really think that we’d be able to evolve as much as we have,” White said. If you’d like to be a contestant on “Total Blackout,” White said that “the audition process is very real.” White said for people who’d like to audition they can Tweet @Syfy to be on the show, and that Syfy does respond. I want to be a contestant on Total Black Out. very cool article. thanks for writiing it. I would love more than anything to be on total black out. I still have my Steve Urkel doll! hi, my name is Tearsha, I would love nothing more than to be a contestant on total blackout with my girlfriend, she scares very easy and I think it would be a great experience for the both of us and I think my girlfriend would be funny to watch in the dark, which she is afraid of. Hello! My name is Britany from Tampa, Florida. My boyfriend Kyle and I would both love to be a contestant on Total Blackout. He isn’t really scared of anything, but I’m hoping that we can disprove him by being a contestant!!! I, however, will say there are some things that do scare me, but I’m itching to try this out! What a way to have a great adventure!!! Hello, my name is Georgette! My husband and I have watched almost every episode and each time it continues to get tensed. We have finally grew the courage to want to be participants on the show. We constantly scare each other around the house so we are confident that we will be winners on the show! My name is Jacob Waters I would like being contestant on Total BlackOut. With my best friend Jordan Eberlein we line in St.Charles Michigan. We both are deadly afraid of spiders. I think we could handle what you can throw at us and the show is sick. Hey my name is Jackise and I’m from California and I know for a fact that my friend Calvin and I are a perfect match for your show if given the chance. I’m small and energetic and afraid of just about everything that I cannot see… however packed with pride so I don’t give up easily. Now Calvin is big and strong and can turn any dark situation light and get the job done (most of the time keeping me calm). We have known one another strengths and weaknesses since our teenage years, and this game will really put our relationship to the test. Hi my name is Brooke I’m 21, I’m from Palmdale, CA, a very dull dry place, nothing exciting out here. I would absolutely LOVE to be a contestant on this show. I just recently found out about this show and I was hooked. This show is so amazing and hilarious. It would be so fun to be on this show I’ve been wanting to do something fun and thrilling for a long time I want this so bad, plus I love Steve Urkell (Jaleel White) lol. Please pick me!!!!!! Hi! My name is Tishanna, I’m a tough girl from Brooklyn. Im interested in your show I believe I am well in tune with all of my 5 senses. I would love to be on your show I consider myself very brave when it comes down to dark. I haven’t seen not one challenge that I may not be able to pass. So when you guys not looking for a pussycat get back to me. Hey! I would love to do a couples challenge with my fiance. We are a funny couple and will bring many laughs to the show. Please gives us an opportunity to be a contestant on Total Blackout. One of the top ten things on my bucket list is to be a contestant on a game show. It would be the best thing ever to have this come true, and I could cross a big achievement off of my list. I would also like to have my best friend Sierra share the experience with me. We would bring competition to the show as well as good laughs! Hi there I’m Jennifer.im 35.I watch every show of total blackout.I am terrified of the dark and bugs.I think going on the show would help me break my fears to where I don’t have to sleep with a night light.the light drives my boyfriend crazy.I think it would be awsome just to be on a TV show. I would love to have my husband on total blackout. Hello. My name is Lacey Spencer, and me and my cousin would love to be contestants on your show. I think it would be a real experience for myself seeings as I am 31 years old and afraid of the dark. My family thinks it is fun to pick on me because of it, so I think it would be awesome for me to show them i am willing to face my fear. My cousin and I absolutely love the show. My blood starts to pump just watching someone else do it and I catch myself holding my breath ,hoping they succeed. I would love to see how far I can push myself and all while laughing at my cousin as well. It would be nice to laugh about being in the dark for once. We are two best friends from Baltimore Maryland and we really would love to be on our favorite show, Total, Blackout!! Hello my name is corina flores and both me and my gf are afraid of the dark. we are ready to challenge ourselfs. we really want to participate. Hi! My name is Megan. Me and my best friend, Kara, are dieing to be contestants on the show! We are both 24 years old and live in the heart of Amish country in Pa. We are adventurous and are looking to overcome our fear of the dark! We would appreciate your consideration and would love the opportunity to be on Total Blackout! my son and I want to be contestants on the show please consider us as mom and son 15 and 43 from Atlanta, we are ready to go and we are not afraid of the dark. My name is Tara, I’ve watched your show several times and I really enjoy it. I would more than love to be a contestant on the show. I really feel like I can completely win this game, or be second place atleast. Nothing really scares me anymore I feel. I am only 23 yrs young, and about a month ago I didn’t know what being scared was until I went to the hospital and literally only had about a month left to live due to walking pnuemonia, if I didn’t go to the hospital for a cough that was getting worse by the day. I really want to push myself into something new and exciting and dark, and feel a new enjoyable scare in total black out room(s). Hello there my name is Jonathan (15) im from Los Angeles California also there is my brother Gordon (19) we, have been watching this show for some time now and we think it would be a great oppertunity to join and have a great expierence and plus my brother thinks its a very very easy game to play so we would great appriciate it if you email back and let us on the show thank you!!! P.s. just because im 15 doesnt mean i cant handle it and also i dont cuss , thank you and hope to hear back!!! I would love to get more information on when you guys will be taking applications! I would love to do this show with my dad or even by myself! Hi, i love this show my girlfriend and i would love to be contestants on this show. i want to see how we would react to such challenges in a pitch black room… it could be so fun and adventurous to do this!!! please!!! we are very interested!! Hi my name is beatriz i stay in los angeles California i’m 35 years old and will be 36 on october. Me and my sister Maria stay watching this show with our kids. Our kids always tell us that we wont be able to play with out screaming or getting scared about what we might be touching. We together want to show our kids that not because were moms we cant do it. I would love a chance to be on yr show, but a couples episode…too scared to do alone. We live in Cheboygan Michigan, a very boring place…help us have fun…please!! I would love to be a contestant on Total Blackout with my mother, because i know for a fact that the two of us could give the show the type of excitement, energy and team work that needs to be displayed. We are a great team and i would love to see her in the dark! hi our names are :Marketa L and Brandie K and we watch total blackout all the time and it is a very great show and i would love to be on the show…but theirs one thing i want to bring my girlfriend with me on the couples show Brandie is very afraid of the dark but i believe that together we can win,and bring excitement.we do everything together. one of us has a phobia of bugs we would be the perfect couple for the show. Me and a good friend of mine love the show “Total Black Out” and during a “friends” episode of the show, we thought “I would totally do that!”. We have been searching for months on how to apply to get on the show, and with little to no luck, we have failed. We don’t care about the money, or weather we win or lose, it’s the experience we want (but winning and getting the money would totally rock too lol!) Anyway, the point I’m getting at is, we would seriously love to be on the show, it would blow our minds and excite our friends and family to see a few locals on T.V. doing some crazy fun stuff. Please get back to me at my e-mail address if interested: Jekel_Chainz@yahoo.com, and thanks much for reading this at the very least! I would love to be on the show to win and win the money . My Name Is Kelvia. My mother “Zeidy” and I are huge fans of your television show ” Total Blackout “. We have searched for a while to sign up to be contestants on your show. My mom clams she’s not scared of anything , that’s she’s the bravest out of my whole family, As for me I would love to be able to get an opportunity to stand up and over come my fears of the dark and etc. We don’t care about the money or if we loose, we just want to experience the reality of facing our fears of the pure darkness. If given the chance, We would be more than excited to be able to participate on your show. I would absolutely love to be a part of this show along with my husband, who loves the show as well. hello my name is diamond rembert and i would like to be on total black out, iv recently been through the worst thing that could ever take place in my entire life and and not afraid of anything anymore….that i think…would u like to prove me wrong? Hi my name is Cristian I’m 17 years old I don’t know if that would be a problem and I would love to be on total black out and I really love your show!! !